I’m back, Astoria! 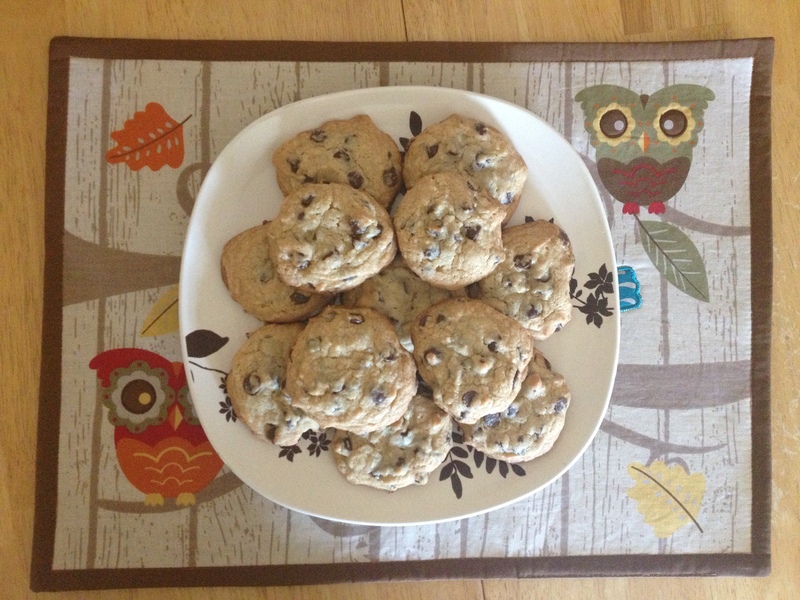 What a fantastic vacation I had, and thank you to all the wonderful people Upstate and beyond that were supportive of Single Girl Cookies as I made my rounds in OBX and Penn Yan. And I’m continuing my kindness outreach beyond Astoria’s borders with my preparation for Tedx Utica, happening in October! If this is news to you, I say, ” What?!? You’d better check out the website, and fast!” If this is NOT news to you, I say, “Sorry dude, get used to hearing about it a lot because it’s awesome and I’m pretty stoked.” I guess my inner voice that lets people down gently is a surfer. I know this may be hard for some of you, (those of you like me who can’t remember what I ate for breakfast today) but think back 10 or 12 days. It was still summer, and the responsibility of being back to regular hours, or back to school, or back to reality was looming, but still not quite there. 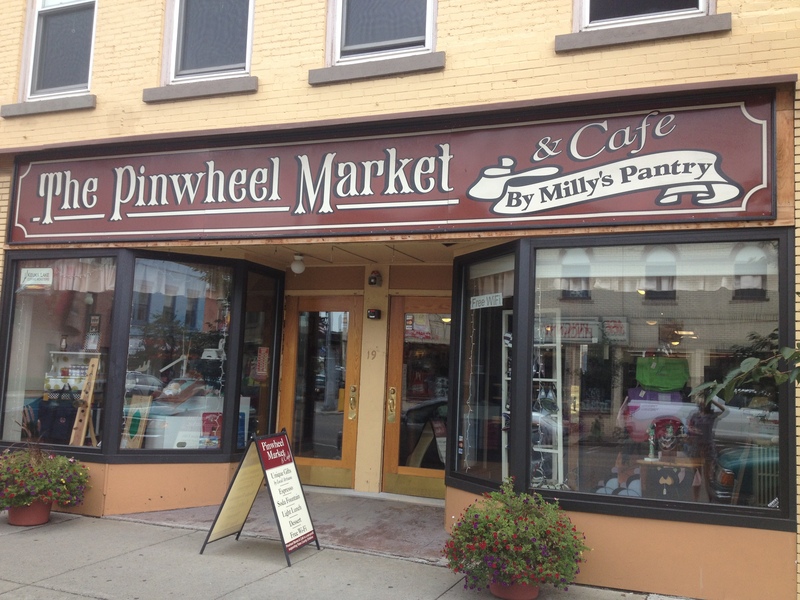 It was in these final moments of freedom that I made my last drop in Penn Yan at Pinwheel Cafe of Milly’s Pantry on Main Street. I had been at the Emergency Room at Soldiers and Sailors Memorial Hopsital the previous week dropping off cookies to reception. How many times have you gone in, late at night (or early morning) with a terrible stomach flu,or a swollen, sprained foot from a stupid dance you move you earlier that day (me) or a pretty deep cut from a super sharp knife (my mom)? And we thank the nurses and the doctors that bandage us up, and give us treatment, but how many times do we thank reception and say, “Hey, you’re doing a good job too. You kept me calm when I was freaking out in your waiting room, and it’s 2 in the morning for you too. Thanks.” Think about that the next time you go in for a water skiing induced hip fracture (my brother). As as I learned, many of the folks that works there are from out of town, and all wanted to recommend I go to their homes 🙂 Ha, nice try, this is not my first rodeo. So you can understand my excitement when someone suggested Milly’s Pantry. 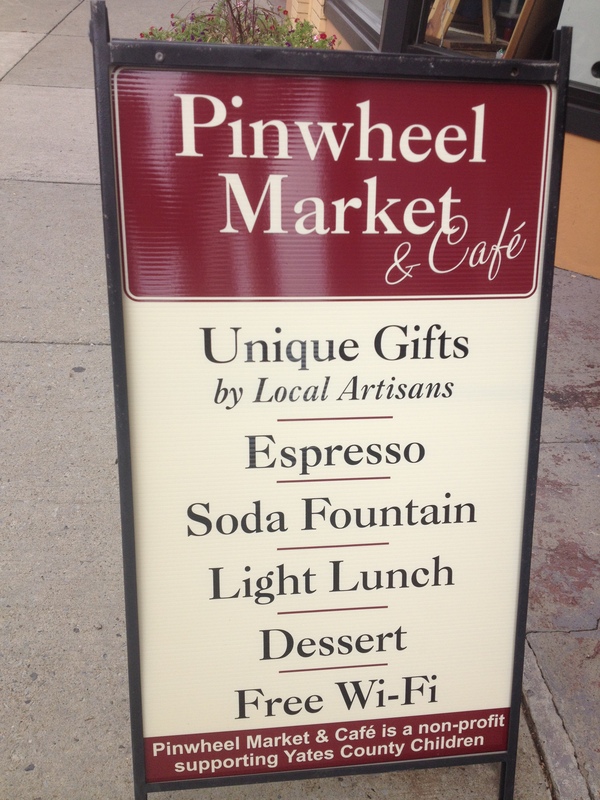 Or Pinwheel Cafe. However they are called. 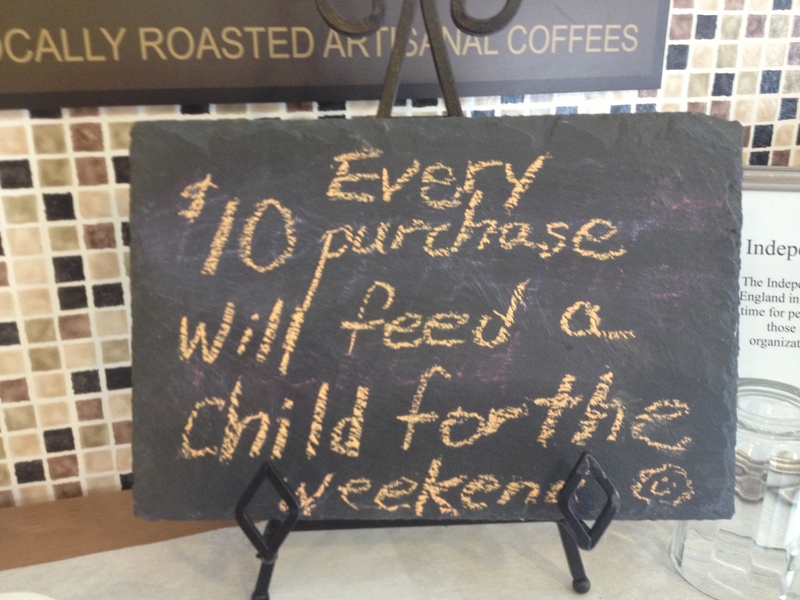 How I under stand is this: Pinwheel Cafe is an offshoot, or under the umbrella of the larger not-for-profit Milly’s Pantry. And I’d give you more background on them, and PY people, correct me if I’m wrong, but neither of them has a website. So my information could be totally off! But that’s how I understand it. When you walk in, you’re not quite sure if it’s a store, or a place to grab coffee, or lunch, or have a meeting. Turns out, it’s all of those things! I found this site that tells a bit more about some of the things offered there and how it helps the community. They also sell local artisan wares, and by local, I believe it’s within 100 miles. That’s pretty awesome. Half of the proceeds go to the artist and half goes to Milly’s Pantry to feed their programs working with the low income population of Yates County. When was the last time you purchased something and knew exactly where the money was going? It certainly wasn’t that shirt you bought last week at Ann Taylor. I was on my way to babysit my fantastical nephew and knew that I should grab something to eat while I was there, and y’all know that’s something I like to do. I encountered a woman named Peggy, just inside the door and told her the deal. In true volunteer mode, her response was, “Oh thank you, but we can’t sell these here.” She thought I was dropping them off (I think) either as an artisan to be carried in the store, or as a “Here ya go, you can make 100% profit on these and that’s my contribution to Milly’s Pantry” kinda thing. I explained further and said, no, no, no, these are for you, no strings attached, just to enjoy. And like a light switch, the response was different. She ushered me to the back of the store where a woman I know, Kathy, was behind the counter acting as chef for the day. Peggy told her about what SGC is and Kathy’s first question was about my lineage 🙂 The pinning down of who I am, and who I am connected to. The next question was, “Are these your mom’s cookies?” Astorians, unless you have something similar in your backgrounds, I’m not sure how much I can convey how famous these cookies are in PY. My mother was the original Single Girl of sorts, but just bringing cookies everywhere. All the time. And still does. And I thought, really? That’s it? Imagine how many children could be fed if everyone that read this contributed even $5. And the thing is, I know these kids. These are the kids in my mom’s classroom, and the ones walking down the hallway that remember me from previous years when I would visit her room, and the ones down the hall in Miss Mulberger’s classroom. I joke with my friends how poor I am (and there are weeks/months when I am) but I know how fortunate i am as well, and have such a huge network of supporters that I am never without. A lot of families don’t have that, or are working their butts off at the local restaurant/bank/dollar store with minimum wage and that’s just not enough to support two kids. So I took my last $10 and stuffed it into the container, knowing it would do more good there than in my wallet. Because I was coming back to Astoria the next week, I didn’t get a recommendation when i went to pick up my plate. But i did come back, and now that plate is in the hands of a contributor to Astoria Bookshop’s Kickstarter campaign; I was one of the perks they offered in conjunction with a cookbook. Kinda neat how they get around, isn’t it? 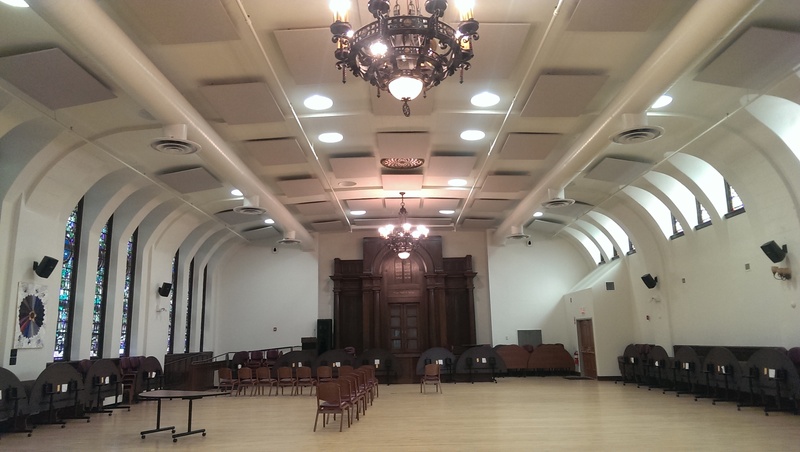 I did do a drop on Thursday of last week, picking up where I left off at Immaculate Conception on Ditmars and 29th. That’s already turning out to be a fun story and I can’t wait to share it with you after I pick up my plate tomorrow. Another thing I want to tall to you about today is the possibility of donating to Single Girl Cookies. You know I’ve been invited to speak at Tedx Utica and I couldn’t be more thrilled. This is probably the coolest thing to happen to me since, I don’t know, birth. But we as speakers are not compensated in any way, including things like travel and lodging expenses, and certainly not for the 100+ cookies that I’ll be making for the event. You didn’t think I’d talk for 12 minutes about cookies and cupcakes and then not reward you for listening, did you? I’m appealing to you all to help me make this amazing opportunity the community effort that Single Girl Cookies has been thus far. There is a “donate button” on the right side of the page, beneath the twitter feed, recent posts, contributors, and I encourage you to think about even $5. It adds up. Then you could donate $5 to Milly’s Pantry and feel like you’ve done your good deed for the week 🙂 It is through Paypal, so it’s super secure, but if you feel more comfortable with paper checks, I accept those too, made out to Single Girl Cookies. Just email me and I’ll tell you where to send it. Thanks! And with that, I’m off to a friend’s house to watch some football and eat some pulled pork tacos. Can we say yum? Friends and food, two things that help me ease into fall, my favorite time of year. I get really excited about apple picking, pumpkin desserts, that beautiful smoky smell the air starts to get, snuggling in sweatshirts and blankets and the start of a new year. What are some fun fall traditions you have?